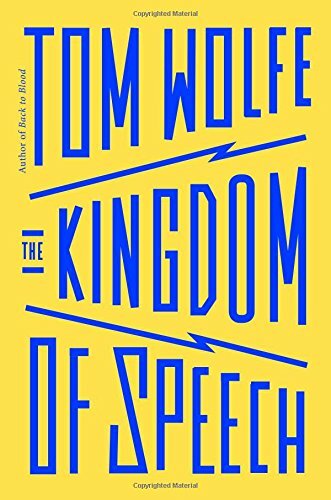 Tom Wolfe's The Kingdom of Speech adds to a growing body of popular books on the topic of how language, thought, and culture influence one another, and more specifically on which one ultimately holds most sway. Guy Deutscher's Through the Language Glass: Why the World Looks Different in Other Languages attempts to convince us of what the book advertises right there in its subtitle. In Don't Sleep, There are Snakes: Life and Language in the Amazonian Jungle, Daniel Everett recounts his adventures in Brazil as a missionary while making the case for language as a cultural tool. And in The Language Hoax, John McWhorter argues against both of these premises—albeit even more against the boiled-down version of these theories that we receive via the popular media. And considering Tom Wolfe's recent interest in neuroscience—a topic that features in his nonfiction as well as his 2004 novel, I Am Charlotte Simmons—we might not find it terribly surprising that this author has now also thrown his white homburg into this linguistic ring. Yet the reader opening this book, looking for Wolfe's take on this debate, might find herself somewhat puzzled by the fact that the first 85 pages concern themselves primarily not with a linguist but with Charles ("Charlie" to Wolfe) Darwin. Certainly, he has good reasons for beginning with Darwin, the first of which is that this focus sets up an important question: how exactly did Darwin, and how do current scholars, explain language's place in the theory of evolution? Of course, it's not absolutely necessary that scholars and scientists do account for how language fits within the puzzle of evolution. One can hold to the theory even if one doesn't understand the mechanics underlying every facet of human development. Nonetheless, Darwin felt that if his theory couldn't explain such a fundamental aspect of what it means to be human, his view of natural selection would be found lacking. As Wolfe tells it, "At that moment, in 1837, Darwin had fallen, without realizing it, into the trap of cosmogonism, the compulsion to find the ever-elusive Theory of Everything, an idea or narrative that reveals everything in the world to be part of a single and suddenly clear pattern." For Darwin, if evolution couldn't account for language, it ultimately failed as a theory. At the same time, Wolfe too has his own sweeping theory, not as grand as Darwin's, but perhaps as rigid—one more concerned with kingdoms of power than the kingdom of speech. You see, Wolfe's second reason for spending so much of the book on Darwin is to introduce Alfred Wallace, Darwin's sometimes friend and noted competitor. So if raising the question of evolution's relationship to language is Wolfe's first reason for dwelling in the 19th century, then introducing Darwin's complex relationship to Wallace is his foremost. Alfred Wallace, like Darwin, had formulated the theory of natural selection, and he almost beat Darwin to actually publishing his hypothesis. Unfortunately for him, though, he sent his manuscript to none other than Darwin, who had been mentally sketching his own ideas for years. Receiving the manuscript pushed Darwin to write his own article, and with his friend Sir Charles Lyell, he worked to publish both his and—in a somewhat magnanimous gesture—Wallace's work in a scientific journal. However, in a less magnanimous gesture, Darwin failed to inform Wallace of this fact (he was in the Malay Archipelago doing biological fieldwork) and raced to turn his article into The Origin of the Species. Thus, while Darwin didn't plagiarize Wallace's idea, it is for suspect reasons at best, Wolfe suggests, that we now see Darwin's name—rather than Wallace's—being devoured by Jesus fish everywhere. In Wolfe's estimation, what makes such scheming especially vicious is that Darwin, a gentleman, was pulling one over on Wallace, a "fly-catcher." In fact, I dare say that Wolfe's borderline obsession with the ethos of the "fly-catcher"—a kind of academic outsider—motivates most of what The Kingdom of Speech actually concerns itself with. Describing Wallace's need to pay for his own scientific field-work and the lengths he had to go to do so, Wolfe writes, "The kind of mortal willing or forced by fate to go into the ankle-sucking mud, brain-frying heat, clouds of mosquitoes, ague-ghastly nightscapes … on terrains slithering with poisonous snakes … to harvest hundreds of curiosities at a time was called a flycatcher. Gentleman like Lyell and Darwin didn't think of flycatchers as fellow naturalists but as suppliers on the order of farmers or cottage-weavers."